"Torture means the intentional infliction of severe pain or suffering, whether physical or mental, upon a person in the custody or under the control of the accused; except that torture shall not include pain or suffering arising only from, inherent in or incidental to, lawful sanctions;" - Crimes Against Humanity Article 7 Rome Statute of the International Criminal Court. "For example if 15 or 20 youths are arrested in one of these sites and one person is beaten or mistreated, torture has a specific meaning, that is why we have to be very vigorous in our use of terms. ...If it is used to obtain a confession, inflicting physical suffering to obtain a confession and we have to differentiate it from excessive treatment or disproportionate use of force." Colleague Pedro Pizano caught the error and referenced Caracas Chronicles on the same report. Will be more cautious in future entries. As Gandhi observed "Truth never damages a cause that is just." 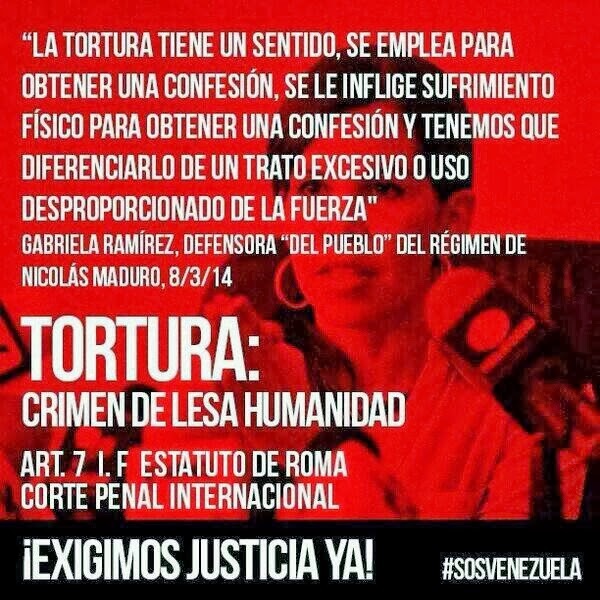 According to Article 7 of the Rome Statute of the International Criminal Court torture is a crime against humanity. Venezuela on October 14, 1998 signed and on June 7, 2000 ratified the Rome Statute. Quote in the above image is in error.